I came across a new blog the other day, Old Bricks, which I thoroughly enjoyed even though I was reading Google Translate's version of the original Italian! The author, Francesco Spreafico, is the Ambassador for ItLUG, the largest and oldest LEGO® User Group in Italy. I like to examine old parts on New Elementary, but rarely find the time. Thankfully, Francesco is fluent in English and has kindly translated a post for New Elementary readers. 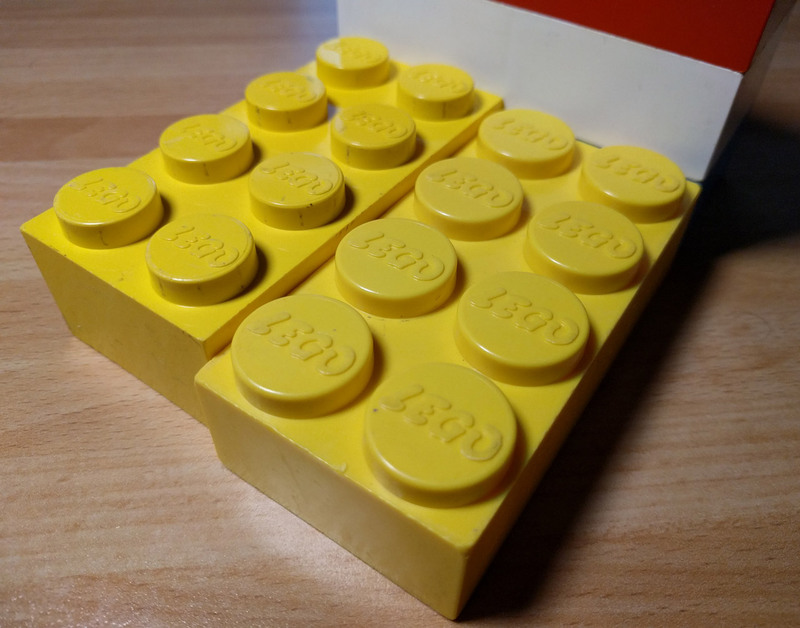 A few days ago I bought some Jumbo Bricks on eBay, so I thought to devote a few words about these strange, old LEGO® bricks, since all the information about them I could find is scattered all over the web and I haven't found a good roundup. 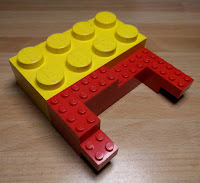 The LEGO Group (TLG) has always been interested in pre-school toys... now we have DUPLO bricks, which are twice as big as regular LEGO bricks and compatible with them. But before that? There were a few predecessors... among them, these so-called Jumbo Bricks that were marketed in America by Samsonite starting in 1964 up until the end of their contract with TLG in 1972. The official LEGO History site recently added a section on this topic and it turns out that Jumbo Bricks were sold in Canada too, until 1970 (and in the US, only until 1971). There, we also find out that this brick was developed in Denmark, as part of the research for pre-school bricks that eventually led to the DUPLO brick, and that it had interested TLG's American partner, Samsonite. This information also appeared in an article written by Inge Aaen (from the LEGO Idea House) about the development of the DUPLO brick, published on BrickJournal #6 in 2013. The article also gives more details about the orders from Samsonite to TLG. 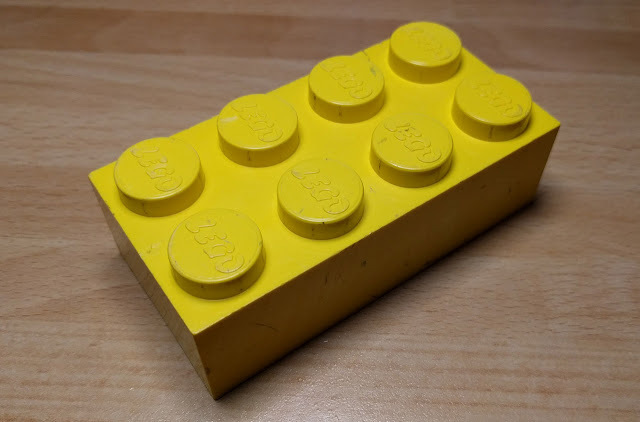 These bricks were about three times as big as a regular LEGO brick; a 2x4 Jumbo Brick measured 1 inch (height) x 2 inches (depth) x 4 inches (width). 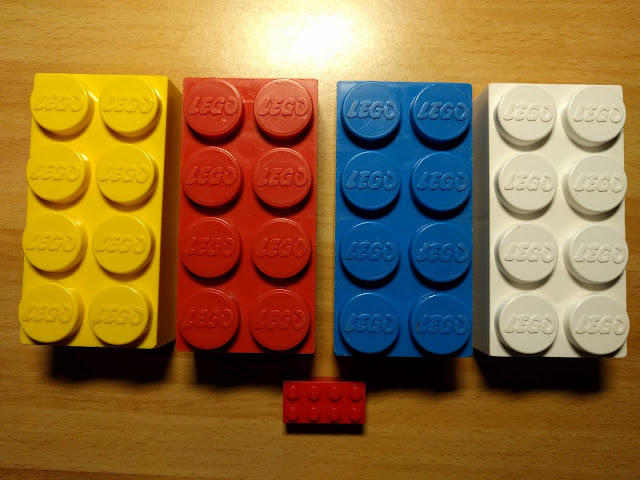 These proportions, 1:1:1 for a unit, are different than a regular LEGO brick's proportions (5:5:6), since a LEGO brick's height is bigger than its width or depth. Curiously, Jumbo Bricks have the same proportions of Modulex bricks. And since a Modulex brick's base measures about one fifth of an inch, every dimension of a Jumbo Brick is exactly five times bigger than that of a Modulex brick. So, to build a 2x4 Jumbo Brick out of 2x4 Modulex bricks you'd need exactly 125 (5x5x5) of them! Only 2x4 bricks were available, and only in four colors: red, white, blue and yellow. Besides these bricks, there also was a special plate (white or grey) with wheels... and that was it, there were no other parts. Known sets containing Samsonite Jumbo Bricks are few: 41 (1964), 105 (1964), 42 (1966), 44 (1969) and 300 (1969). There also was a set available only to schools in 1968. In Europe only three sets were sold, and only in a few countries in limited quantities, as a test. These sets had bricks with slightly different proportions to the American ones. The European bricks were exactly three times as big as regular LEGO bricks and they kept their 5:5:6 proportions (so they were a bit shorter in width and depth and a bit taller in height than their American counterparts - see image below). They were still incompatible with regular bricks, but they were getting close to the logic used for DUPLO. The three sets were: 501 (1966), 502 (1968) and 503 (1968). In 1969 DUPLO bricks debuted and they followed the "500" numbering system. These different European bricks (rarer to find today than the American ones) are definitely the ones included in those sets... there have been a few doubts, but I believe these two photos from BrickShelf are pretty clear. Also, to make things more complicated, BrickLink doesn't differentiate them from the American ones. The official LEGO History site briefly mentions these sets at the begininng of their chapter about DUPLO bricks, not associating them to the American Jumbo Bricks and considering them only test predecessors to the DUPLO bricks. Also, it's not entirely clear whether or not the European version was officially called "Jumbo Bricks", like the American one. One last fun thing: if you go to BrickLink you will find a few more parts and not just the 2x4 bricks mentioned here. Parts that cost a bit of money too. Where are they from? Their history is fascinating; they first appeared about 20 years ago, from a house in Ole Kirksvej, Billund that was to be demolished; the house had belonged to one of Godtfred Kirk Christiansen's brothers. These parts then spent more years stored somewhere and last year they appeared again and were put on sale on BrickLink. They're prototypes of European 1x1, 1x2, 1x4, 1x6, 2x2 and different-coloured 2x4 Jumbo Bricks (and a 1x1 plate!) that were never sold at the time. The story of this discovery is told in this topic on the BrickLink forum and in this Facebook post by Gary Istok. As is usual with old LEGO topics, some questions still remain unanswered. For example, where do the American yellow bricks (on BrickLink and eBay) come from? If you check the Samsonite sets' inventories on BrickLink there seem to be no yellow bricks at all... and their prices - only slightly higher than the blue, white and red ones - don't look like the prices of a particularly rare part available only by indirect means. And certainly at least some of these bricks are American... since I own one and I got it very easily on eBay. Probably all or at least most of the available ones on BrickLink are American, since the sellers are all in the US and the European variant is more rare. Of course there could simply be an incomplete inventory... maybe in the last Samsonite set, which does show some yellow bricks on its box... (and, according to TLG, it should be from 1971 and not 1972). In case of new data (which sounds weird since we're talking about things that happened 50 years ago... but it happens all the time!) we'll update this post. 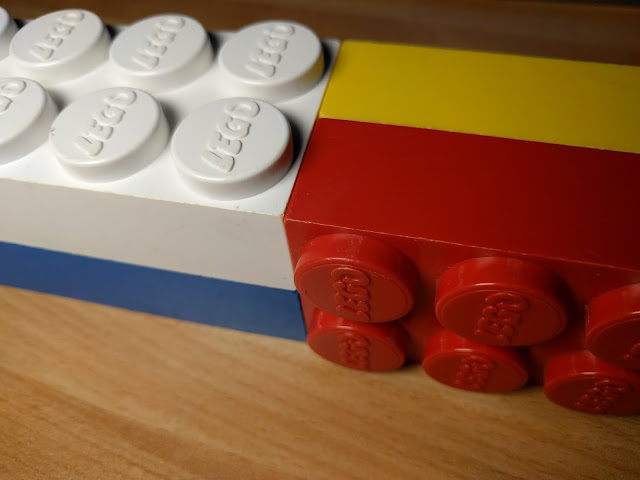 READ MORE: Remember when LEGO was just bricks? No, you don't, because it never was. This article first appeared on Old Bricks, where you can read other interesting articles about historical LEGO elements (Italian only). 3:1 ratio does not equal 3x the size for a 3D object because it's triple the length, width, and height. 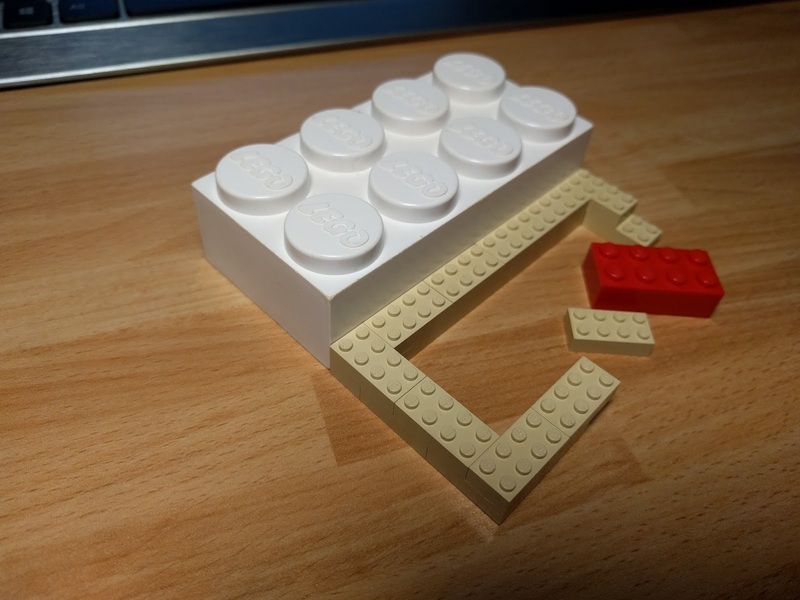 Much like the American brick is 125x the size of the Modulex brick, the European one would be 27x the size of a standard LEGO brick. I had no idea these wonderfully obscure Jumbo Brick even existed! A shame they are not compatible with System or Duplo. It would be interesting to see a side-by-side comparison with Quatro brick and the 45003 Soft Bricks. When you have chosen your venture you have to make sense of what number of brick cleaning service in indianapolis your will require. That explains the weird bricks I recently inherited! I had asked around r/lego but no one seemed to know what I had and/or seemed interested so I'm glad I stumbled across this article while checking out unrelated stuff on your site, thanks! That’s great!! Thanks for letting us know.